The Fundamentalist belief that dinosaurs and man lived together. Wow. 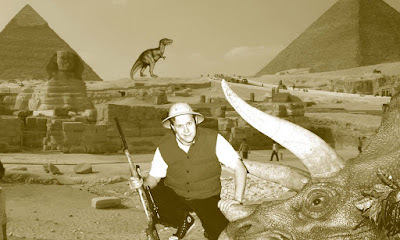 I didn't know they had pith helmets *and* Converse shoes back in dinosaur days. And are those motor vehicles in the background? I'm so confused! What appear to be a pith helmet and cons are in fact, evolutionary adaptions. The helmetlike protrusions from the temporal, perietal,and occipital plates of the skull allow the focused direction of sound, improving the hunters directional hearing. What appear as cons are in fact, modified hair follicles emerging from the metatarsals area of the foot and progessing through to the phalanges allowing increased mobility and speed. The "star" emblem stems from interbreeding among individuals of the same family groups. However, what you all fail to notice is the advanced state decay of the pyramids and sphinx. It is evident that they were built long before. It is clear, therefore, that aliens visited earth thousands of years BEFORE the man hunted dinosaurs with rifles equipped with telescopic scopes. Consequently, without the inclusion of aliens, this exhibit lacks the appropriate authenticity.